Most of the boards I've been getting lately have required adjusting the offset to function properly on DMR. Many boards are shipped with a sticker on the bottom with the required offset. These are usually pretty close. There is however a way to get this more exact and specific to your radio. Luckily there is a utility built in to Pi Star that enables you to tune your offset. All it requires is pen and paper, a calculator and a little time. Step one is to gain ssh access to your Pi. The easiest way to do this is go to "Configuration" then click "Expert" then "SSH Access" and log in with pi-star and your password. Then go back to SSH and type "sudo pistar-mmdvmcal" this will start the calibration program. Type "m" this sets a 1031 Hz test tone. Next press the "space bar" to start transmitting. You should hear the test tone on your radio at this point. Next press the "f" key repeatedly until the radio goes silent. After that press the "F" key multiple times until the tone comes back. Write down the frequency at which the tone comes back. Now you have to go the opposite way. Press "F" until the tone stops followed by "f" and write down the frequency where the tone comes back again. Next subtract the lower frequency from the higher frequency of the two you just wrote down. Divide that number by 2 and add the result to the lower frequency. Now the difference you get from 433mHz is your offset. Once you have your offset you have to set it in Pi Star. You'll need to go to your pi-star dashboard, then "Configure" and "Expert" Now click on "MMDVMHost" Scroll down to "Modem" and enter your offset in RXOffset and TXOffset. Don't forget to click "Apply Changes"
Still having trouble talking to your hotspot? The above method will usually get you close enough but if it doesn't there is a method to tune your hotspot for a minimal BER. First, set your radio to 433.000mHz Talk Group 1 and Color Code 1. Next, use the same command in SSH to start mmdvmcal "sudo pistar-mmdvmcal" then press "b" to start the BER tuning program. While pressing the PTT on your radio press the "f" key or "F" key to adjust the frequency until you get the smallest BER you can achieve. However far off you are from the starting frequency of 433mHz is what your RXOffset should be set to. Tip: These are the instructions for DMR. When you start the mmdvmcal program it displays a list of codes for other tests and other modes you can test. My copy of pistar-mmdvmcal does seem to have a "b" command to start the BER tuning program. Am I missing something or has it been removed from the pi-star software? I haven't done it in a while but it should show a list of commands as soon as you launch mmdvmcal and the "b" command should be listed. Thanks for posting this guide. Please could you just clarify what you mean by "until the tone comes back"? I am finding around 500Hz difference between the point where the tone is first audible (with some digital noise) and the point where it becomes a clean signal. Interestingly, this only happens at the bottom end. The top end goes from silence to a clean tone in the space of 50Hz. 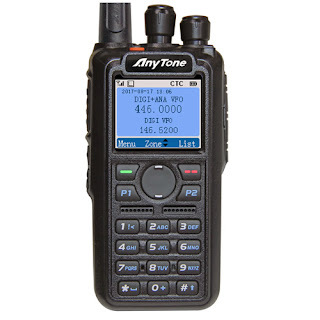 Anytone AT-D868UV My Review Very versatile and all around great radio This is a huge upgrade from the Radioditty GD-77. Now don't get me wrong, the GD-77 is a fantastic radio for the price. I picked mine up on a lightning deal for around $65 compared to the Anytone at around $170. However if you can afford the Anytone it is definitely worth the upgrade. 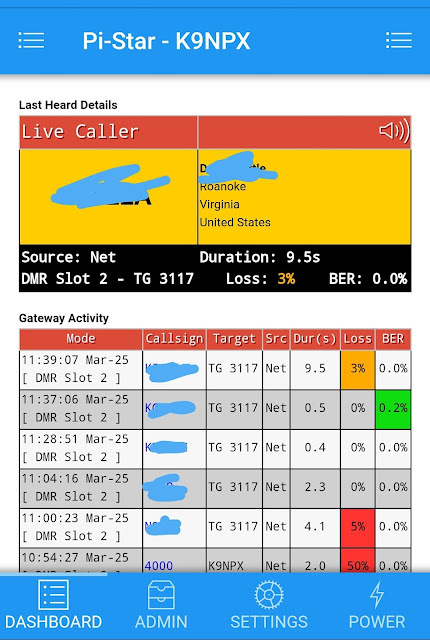 Here is a handy mobile optimized dashboard for Pi Star installations. This doesn't change the default dashboard or any other operation of your Pi Star. This is simply an add-on. To install or update just follow the instructions below or from Marshall's post. SSH into your Pi Star installation. Go to your Pi Star dashboard. You'll need to click "Configure" and "Expert" you'll see the expert settings warning screen and on the right under "Tools:" you'll need to click "SSH Access". Login with the same username and password you use to login to the dashboard and you'll be taken to a terminal session. For those that are new to DMR hopefully this will help you get on air. You may have heard the term CPS, basically it's the software we use to program the radios. The files created are called "Code Plugs". You may be able to find code plugs created by someone else for your radio that have what you want mostly included however, I find it much more rewarding to write my own. You'll also get a better understanding of how these radios work by writing your own code plug.